Each year, St. Paul’s Hospital provides care to over 380,000 patients throughout the province. World-leading research and medical teaching initiatives form part of this valuable institution’s core. St. Paul’s was the first BC hospital to treat AIDS patients as the disease took form in the early 1980s. As primary care provider to Vancouver’s Downtown Eastside residents, St. Paul’s serves the majority of the city’s most severe mental health emergency patients. For the 15th year running, the elaborate Lights of Hope display will grace the façade of St. Paul’s Hospital in downtown Vancouver. This year’s lighting will include a family-friendly celebration. Arrive at 6:30 at Burrard between Helmcken and Davie, in time for the lighting and fireworks; stay until 8 pm for an outdoor community event. The Lights of Hope display is a tradition that Vancouverites either look forward to or consider a Vegas style overkill. Either way, it’s part of our city and a project that takes months of planning together with over 100 volunteers. It all starts early on a Saturday morning, when the team meets rain or shine to get the display assembled. About six hours later, the creation is ready to greet the city’s residents! The Lights of Hope campaign raises funds to support the hospital’s greatest challenges, enabling them to meet urgent needs for equipment, research and enhanced patient care, when and where they arise. You can help realize their goal of raising $2 million by donating online. 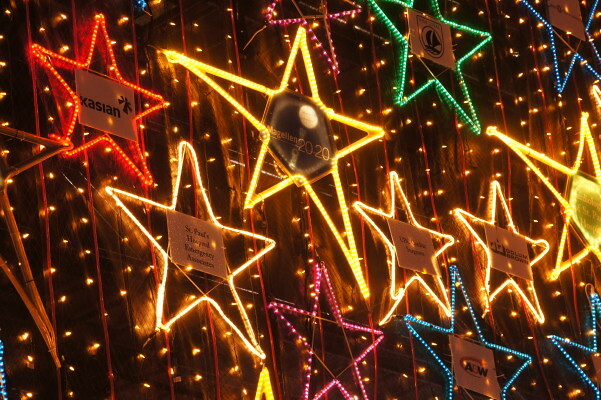 The Lights of Hope display can be enjoyed nightly from November 15 to January 10, 2013. Thanks, Ariane. Will we see you there on the 15th?